Laurie David, the producer of An Inconvenient Truth, and Cambria Gordon have written an extensive resource for parents and children, “to know the truth about this problem and what they can do to help solve it.” The Down-to-Earth Guide to Global Warming helps readers understand the causes of our climate crisis and offers suggestions for change in a very kid-friendly format. The book is also constructed from 100% post-consumer waste recycled paper and printed with soy inks. Over the past 200 years, our oceans have absorbed about half of the CO2 emissions that are in the atmosphere from the burning of fossil fuels. That’s an enormous amount, which only shows how important the oceans are to our natural carbon cycle. One of my favorite sections of The Down-to-Earth Guide to Global Warming lists sustainable careers and asks children, “What do you want to be when you grow up?” Asking children to consider their career ambitions in light of climate change sparks a very worthwhile conversation. From hydrologist to biofuels engineer, children are encouraged to select a future that is sustainable and fulfilling. In reviewing The Down-to-Earth Guide to Global Warming, I wonder why the author selected the term “global warming” in the title. I believe the book’s content reflects the problem of “climate change”, including the changes in weather systems, rather than “global warming”, which refers to the overall warming of average temperatures. These terms are not interchangeable, and I believe that climate change more accurately portrays the crisis we are potentially facing. This issue in semantics may not seem important in the big picture, but I believe in equipping children with the proper terminology. For an interesting perspective on the terms “global warming versus climate change”, visit grinningplanet.com. There are many critiques of The Down-to-Earth Guide to Global Warming on online bookstores suggesting that inaccurate information is represented on a chart comparing temperature rise and CO2 emissions in the last 650,000 years. I do not have the expertise to judge the scientific merit of such criticisms; however, many of these comments are left by people who dispute the causes or existence of climate change. Upon reading The Down-to-Earth Guide to Global Warming, I felt a few of the analogies were a far stretch or slightly bizarre in an attempt to appeal to children. For example, the concept of sustainability is compared to the love a pet, “even though your cat might pee on your bedspread or your dog might chew your favorite flip-flops.” The planet is also compared to a child’s messy room, or CO2 and temperature “go together like peanut butter and jelly”. I guess I find these comparisons shallow and too contrived for the target age group, but the message of this book is powerful and should be heard by all adults and children! 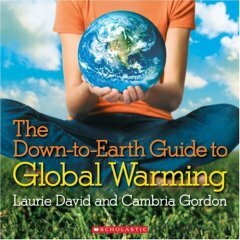 The Down-to-Earth Guide to Global Warming would be a great resource for any teacher or homeschool parent. Each section of the book could be a unit of study, and service projects will naturally unfold from the explanations and suggestions. If human actions are going to alter the negative path of climate change, children need to be educated and involved from birth. This book is a great reference and catalyst for discussion.